Audrey: 17 lbs, 11.5 oz. 29 in. 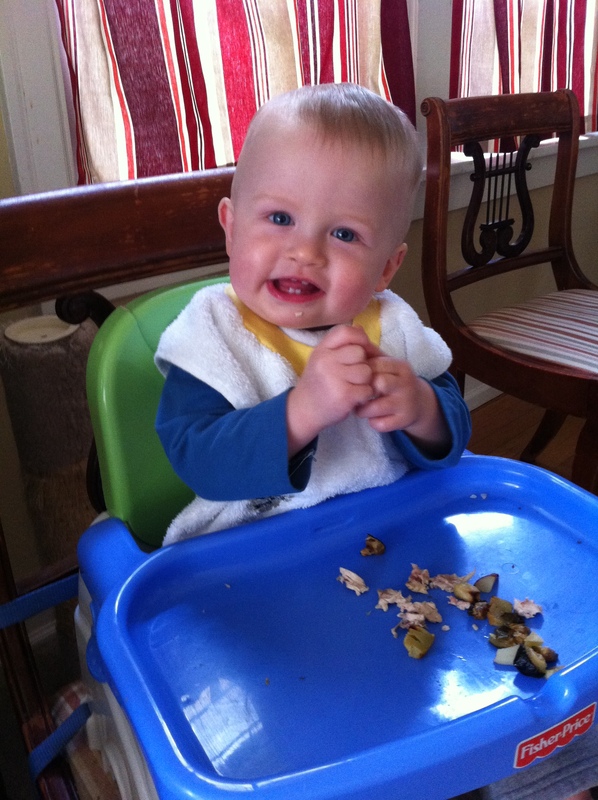 Dr. Tom told us that if he didn’t know she was a preemie and a triplet, he would think she was a normal one-year-old. Theresa: 19 lbs, 5 oz. 28.5 in. 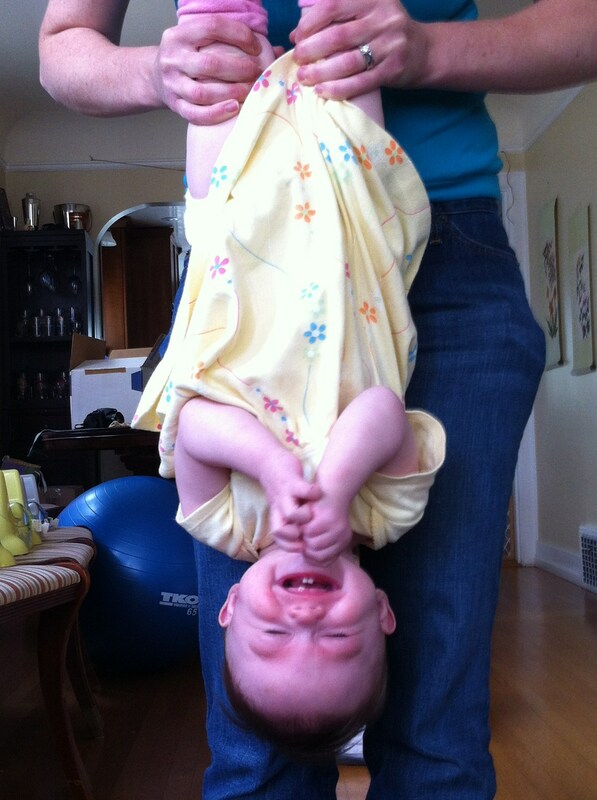 Was a champ for vaccinations–didn’t cry at all! Audrey loves to explore. Take her to a new place with books or toys within reach, and after a few moments of observation, she’s off. Audrey has learned to drink from a sippy cup without spilling. Theresa and Audrey love chewing on wet washcloths. Helps gums and cleans teeth. Theresa crawls on hands and knees. Her first destination after months of immobility? The heater grate. 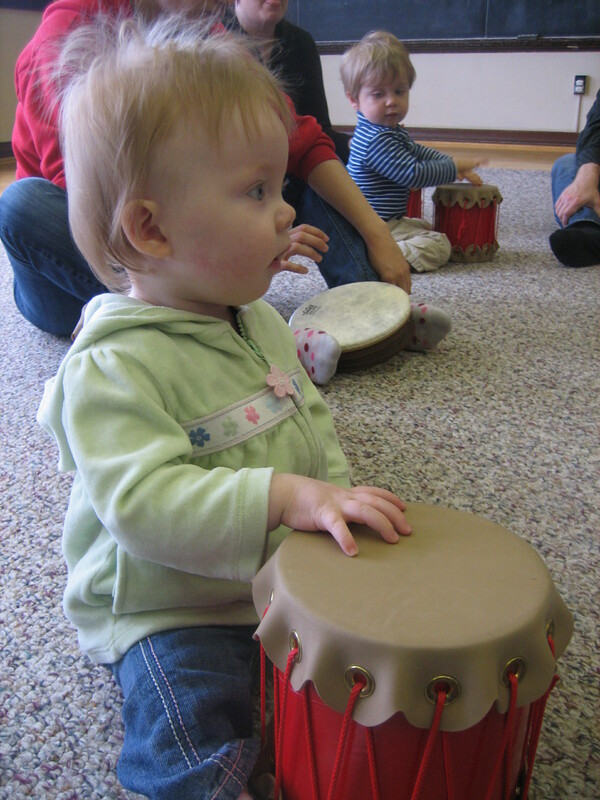 Theresa listens carefully at music class. Theresa pulls herself up on gates, chairs, people. This morning, she started figuring out how to get down again. Theresa is learning to brush her own teeth. I showed her how the bristles go on her teeth and gums, and instead of chewing on it, she actually moves it around in her mouth. Theresa holds an object straight out in front of her, tenses all arm and shoulder muscles, and her whole body shakes with intensity of feeling (which feeling, we’re not sure). While shaking, she says, “Aaaaahhhhhhhhhhhhh” in her enthusiasm to express the strong feeling. Jamie stands by himself regularly and with good stability. Jamie loves climbing: the stairs at the play center, the new slide from Uncle Jeff and Aunt AJ. He’s very persistent. And strong. Jamie’s favorite pastime is taking all the board books off the shelf. Then he sits down in the pile of books and turns pages. Seriously, where is the board book of Henry V when you need it? Audrey and now Jamie crawl on all fours with a toy (or, sometimes in Audrey’s case, a wet washcloth) in their mouths, looking very much like a retriever puppy. all three of them continue to love mimcry. If one shakes her head, the others quickly follow suit. If we clap, they clap. I raise my arms in a V; they do the same. broken naps no longer make me crazy. Simul-napping used to be the only mental break I had during the day, and if they were awake and making noise through the monitor, I could not relax. I have learned to let go of trying to telepathically force them to fall asleep during naps. How much fun! We can’t wait to see them in action in August! They’re learning new things so quickly, and times are only going to get more exciting! Have a great weekend!